What does learning look like in a world that is increasingly networked? How can we harness the ever-increasing range of online technologies to support effective learning? What are the implications for teachers, for students, and for the wider community? And what are the implications for distance education providers as the boundaries blur between them and traditional face-to-face providers? These are some of the questions I explored in my keynote to the AADES conference in Melbourne last week, in which I explored current trends in education and how these are re-shaping how we think about schooling, teaching and the role of learners. My focus was on how we might respond these questions in order to meet the challenges of learning in a networked world – particularly as traditional providers of distance education in the schooling sector. The diagram at the top of this post is a re-hash of one that I originally developed over a decade ago to help explain this convergence. 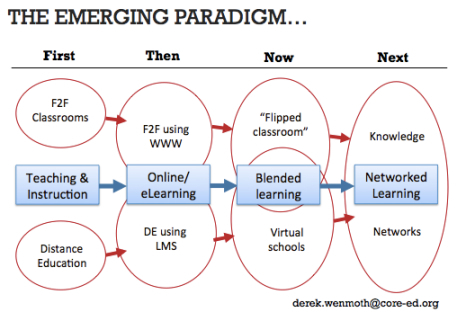 While the concept of 'blended' (or 'hybrid' learning) is emerging as a more common practice in our schools and universities today, I feel we need to be thinking beyond that, to a time when we won't be thinking about the blending of anything (which somehow keeps our focus on the separate entities being blended), but will simply operate in a completely merged, and networked, environment. Great article and really thought provoking presentation Derek – thanks for sharing.